Shaylee Hubbs's family ranch in Daville, Calif. become a whole lot cuter when her family adopted a baby cow named Goliath. Goliath had been a "drop calf" from a dairy farm, as reported by Fox News, and he was sickly when first brought to the Hubbs farm. The family's three dogs took an immediate liking to Goliath, especially their great dane Leonidas, Hubbs told Fox News. Leonidas "would lick the little cow on the face and try to nudge him to stand up," Hubbs told ABC News. "He would lay down with the sick, little cow for hours just to keep him company." Shortly after, Goliath began to act like his new family members. Although it may be surprising to learn a cow can behave in such a way, the truth is that cows' intelligence and social nature is often underestimated. Care2 explains how even abused cows - like Goliath once was, can "heal and learn to trust humans once more, (...) they do have an amazing capacity for forgiveness and understanding of the intentions of new people they meet." Not only has Goliath learnt to copy the family's dogs and to eat from their water and food bowls, but also how to cuddle up on the couch, as Fox reports. He even loves being scratched on the head and snout like most dogs! Care2 also explains that, like dogs, cows also love to "happily follow around people they know are going to give them attention." 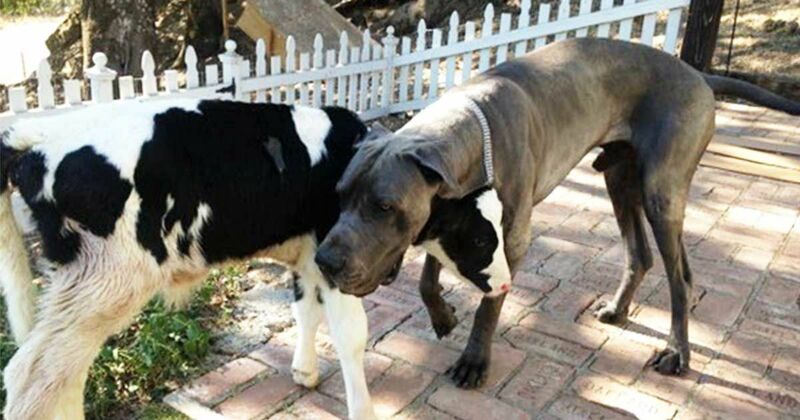 The similarities between dogs and cows go beyond their intelligence and affection, Choose Veggie explains. Both are able of complex thinking and cows have been reported leaping with joy and excitement when they solve a problem (like finding food after solving a maze!). Watch the video below for a brief interview with Hubbs and Goliath.